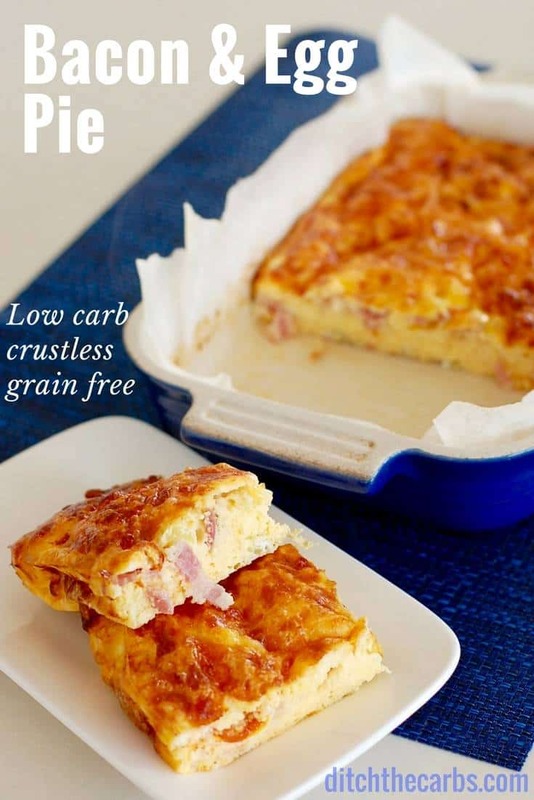 Easy Crustless Bacon And Egg Pie - genius! 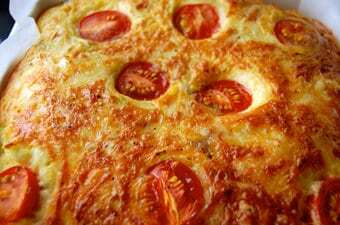 Keep life and food simple by making my crustless bacon and egg pie. Going crustless is a brilliant, fast, easy and cheaper way to be gluten free. Stop buying gluten-free flours, or any gluten-free product and start saving your money. They’re highly processed carbs rich in starches. This is such an easy recipe. Just turn the oven on and by the time it is up to temperature, you will have thrown all the ingredients together. It is also a fabulous way to add extra greens such as spinach, zucchini, asparagus, or any leftover vegetables. Eat it warm with a side salad, or cold for work, school lunch or a picnic. You can even add your favourite herbs such as basil, chilli, rosemary or maybe a pinch of curry powder. Leave a comment below, on what you add to your crustless bacon and egg pie. I love making crustless pies (or some may say, quiche or frittata) because you can simply throw anything in from your vegetable drawer, or leftover cooked meat and voila. All of a sudden you have breakfast, lunch, dinner or a snack made. They are sturdy enough to survive the school lunch box and adaptable enough to suit even the most pickiest child. Crustless bacon and egg pie is an absolute classic. An easy recipe to whip up for a picnic, dinner, lunch or gathering. 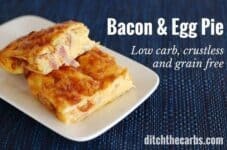 Cut into squares, triangles or fingers to enjoy this low carb keto dish. Whisk the eggs and milk with a fork. Add all the other ingredients, reserving the tomatoes and extra cheese for the top. Add any vegetables and stir gently. 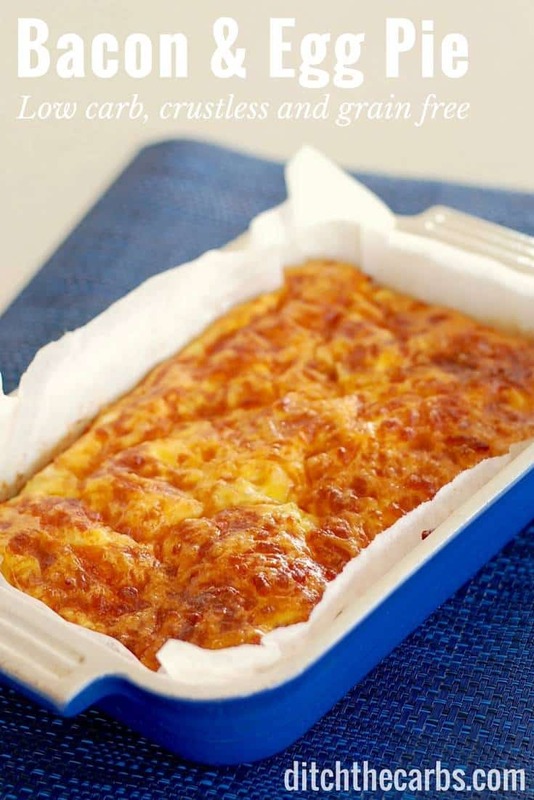 Pour into a 20cm/8inch square baking dish that has been greased and lined with baking paper. You may need to move the vegetables in the dish with the fork so they are evenly distributed. 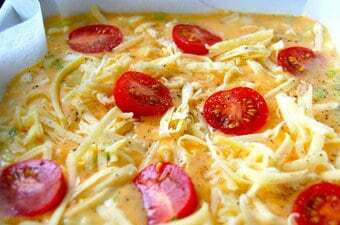 Place the sliced cherry tomatoes and cheese on top. The nutritional values, are calculated on the recipe without added vegetables. You will have to calculate the vegetable values depending on what and how much you add to the pie. I have made this for a couple years. Only I called it “oven omelet”. I will also add some sour cream to my beaten eggs and that adds a little zip. I will cut them into squares and take them in my lunch along with a low carb biscuit. Thanks for always giving us some good recipes. 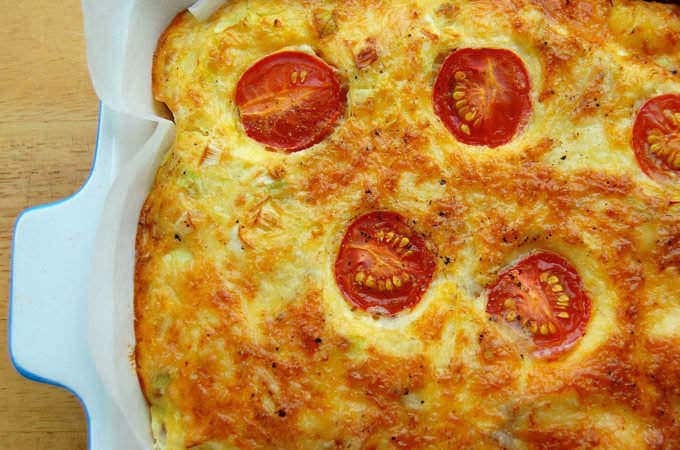 Hi Libby – I love this recipe but wondered whether you had ever tried to microwave? I tend to leave the microwave just for preparing my Fat Head pizza dough or mug cakes. Sure thing. You may omit it or substitute for cream cheese or sour cream. Why does my egg ‘split’ or look curdled ??? Hmm, not sure. What else did you add I there? Is your bacon got some extras that may have made it curdle? You can mix all your dry ingredients and put them in your baking dish or muffin tins to make sure that you get a uniform result. Then pour the liquid over the top. As for ingredients, I like mine pizza flavored, so it’s tomatoes, pepperoni, and anything else I’d put on a pizza. This looks so tasty – I just made one and put it in the oven – how do i know if its done if there is a 10 minute variation in the cooking time as it says in the last paragraph. The cooking time at the top is 30 mins. I am so glad you are finding that useful, I cannot tell you how many hours it took me (and cups of coffee). 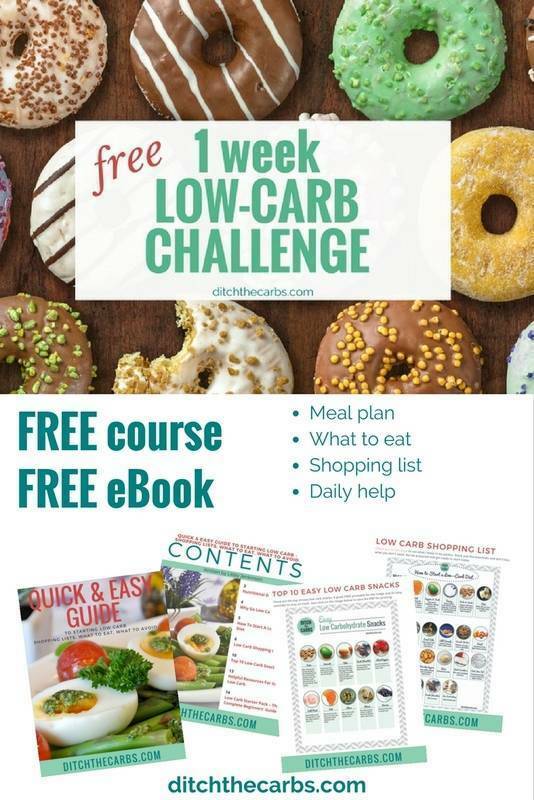 Well done to your aunt for keeping her diabetes under control through low carb. Fabulous. It might just have a looser texture but it would still work. I like sausage, browned and crumbled in mine. I mix hot and mild sausage for a little kick. Could add jalapenos too. Or some Rotel. I have just tried this & used ham instead of bacon – it is absolutely fabulous. Will definitely be making it again. This very nice but how do you stop the bottom from being soggy? Make sure you choose bacon which isn’t pumped up with water. The bacon and egg pie cooks throughout to be a solid and sturdy dish. If you are still concerned, you could omit the milk to make it even thicker. I only add milk so it is light and fluffy. When preparing the dish, do I oil the dish first and then the paper or paper first and then oil? Oil the dish, then line with baking parchment. It allows the baking parchment to stay put. Do you think this would work if it was baked in a muffin pan? Then you’d have neat little yummy muffins! Absolutely!!! Go for it. They would be amazing low carb snacks, lunch or dinner. They could even be frozen too. Such a good honest recipe. I use it often but with changes as I have ingredients. Today it was onion, green pepper, leftover asparagus and leftover shredded mozzarella. Last week I had a quarter cup of ricotta that I added to the scramble. I’ve also used breakfast sausage, feta crumbles, and sliced Apple. Always so good. Thank you! I might be a bit late but is the sugar in the nutritional panel from the tomatoes? I am trying to go sugar free and still a little confused! Yes that is the sugar in the tomatoes. You could omit them if you like. I added a couple small home grown sliced zucchini and garnish on top with asparagus. Yum. I have a mess of chickens and too many eggs sometimes in the winter, so- needed a crustless quiche recipe. This is superb, easy and filled with good ingredients. Thank you much for sharing and I will continue to make this time and again. can you use cottage cheese instead of cheese? Cottage cheese may have a bit more liquid, so as long as you drain that off, it should be a nice change to use it here. Great suggestion. Do you think this would work without milk? Yes, it would just be more ‘solid’. The milk lightens up the texture a little. Libby, thank you so much for including the American metric equivalents. I have NO idea how to convert ANYthing. Very considerate of you! Thank you Courtney, this really means a lot. Sure. I would decrease the milk from 150ml to say 100ml as the low fat milk will be a bit more watery and so may make the egg mixture a bit too sloppy when baked. Do you Think it would freeze? Yes it does. I always wrap it in baking paper then in an airtight container in the freezer. Made this last night and it was delicious! I didn’t add any extra veggie as to keep the carbs down. Yum! Mine took at least 30 min……used ham….was great! The bacon goes into this uncooked? american bacon is mostly fat and english bacon is more meaty. So, for US, i would cook bacon first or use bacon bits!! Excellent recipe and so versatile – thank you! Thank you for this recipe. Now I know what to have for lunch. I will also add mushrooms to this recipe. definitely adding ckd chard or beet greens & some diced onion & minced garlic. YUM with the tomatoes!